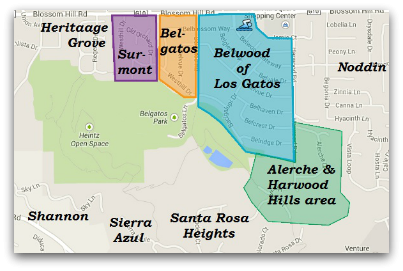 Welcome to the Belwood, Belgatos & Surmont areas of east Los Gatos! It’s a bit crowded to name this site (and blog) after Belwood of Los Gatos, The Belgatos Area and the Surmont Subdivision – so for the sake of brevity, we’re running with Belwood. We realize there’s a difference – but as a geographical marker, Belwood is the best known. So please indulge! Where Are The Surmont, Belgatos and Belwood Neighborhoods? Belwood of Los Gatos is a delightful neighborhood on the far end of east Los Gatos. It is adjacent to Belgatos Park, a very large town park with both a playground and picnic area and also lots of trails. The Belwood part of the neighborhood extends from Harwood Road to Belgatos Road and is bordered by Blossom Hill Road and Belridge Drive. The far west area, including part of Westhill Drive and Surmont Avenue, is referred to as the Surmont subdivision and it was the first part of this area that was built. In between, from Belgatos Road through Belblossom, is the Belgatos area. Altogether, it is a community of about 500 homes with a large park and cabaña at the heart of area activities. Turnover is low – people who move here love to stay here. With meandering roads and wonderful amenities, this beautiful corner of east Los Gatos is a friendly and active community. There are year-round community events (4th of July celebration, Bingo Nights, Movie Nights in Summer and Christmas Carolling in winter) and there’s a highly successful swim team, the Dolphins – so there’s lots that draws the neighborhood together. The Belwood-Belgatos-Surmont area is a very safe one in which neighbors are frequently seen strolling, walking alone or in groups or power-walking with their dogs, pushing strollers (often jogging! ), biking and occasionally even riding on horseback, making their way to the park or to a stable nearby. Usually you cannot walk a block without seeing someone else out too – it’s not crowded in the least, but it is “active” with folks enjoying the outdoors. People doing serious training will jog, hike or bicycle up to the top of steep Harwood Road too, where they earn a spectacular view of the valley and, if desired, entrance to the top end of Belgatos Park. It is very strenous but rewarding to make it to the top! The neighborhood is such a pleasant place in which to spend time that folks from outside the immediate area drive in, park their cars, and then take in the scenery while getting exercise. In addition to all of the natural beauty, quiet roads and trails, the cabaña has a gorgeous pool, lawn area and basketball hoops for summer fun & exercise too. The Belwood HOA has a meeting the 3rd Tuesday of each month at 7:30pm at the Cabaña, located at 100 Belwood Gateway. Microclimates are normal in California. What can surprise folks, though, is that the climate in east Los Gatos (and nearby areas) can be a whole lot nicer than downtown or parts of town west of the crest of Blossom Hill Road. Why does this happen? Because our weather is dominated by the Pacific Ocean, clouds and fog (and inclement weather) often arrive via the pass in the Santa Cruz Mountains on which Highway 17 is built. So when the fog is pulled in, or a storm blows through, it comes straight through downtown Los Gatos and on into Campbell, pretty much following highway 17. It can be ferociously windy at times!! But if you go east along Blossom Hill Road, you climb a bit while going over the hill for which the road was named (Blossom Hill). At the crest of it, which isn’t all that high, you’ll enjoy a brief but lovely view of the valley. Coming back down and approaching Union Avenue, the weather is far milder. Where did the wind go? It’s blocked by Blossom Hill. Belwood isn’t protected from all wind or bad weather, of course, but many days it’s noticeably nicer here in Belwood than at King’s Court Shopping Center or points further west, courtesy of Blossom Hill. It’s just one more reason to love living in Belwood. The large open space with a big building in the middle is Mulberry School. The cabaña is in the upper right corner with the big pool.